Costs of the Ferguson, Missouri riots still trickle in. The variance of it is still hard to track down due to costs outside the known figures government officials have tallied. The business and personal side still have to be studied. I have tracked down some articles dealing with both the August and December riots. The Gateway Pundit reported in October the total August costs of the first riot to taxpayers was around $5.7 Million. The massive police response to Ferguson in the wake of the shooting death of Michael Brown on Aug. 9 will take nearly $1.5M from the Missouri state budget. According to the Missouri Department of Public Safety, the Missouri State Highway Patrol costs total $1.1M while activating the National Guard will cost the state roughly $384,000. This estimate is solely for the initial response: from the time protests erupted right after Brown died to the last few weekdays of August. St. Louis County officials estimated the county’s initial cost will be $4.2M. That’s a combination of money going to police overtime, fixing damaged cop cars and food and supplies for first responders. Channel 4 KMOV/St. Louis reported part of the costs in the August riot was overtime paid to law enforcement and civilians which totaled $855,000. 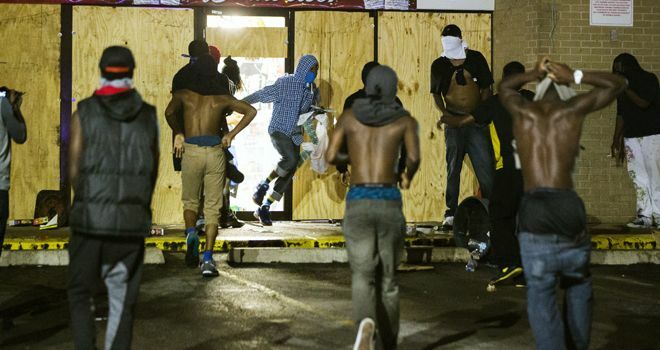 The December Ferguson riots cost $20 Million according to Garry Earls, St. Louis CFO. Roughly 40-60% of small businesses never reopen their doors following a disaster. Businesses in Ferguson face additional challenges. Property Casuality 360 pointed out those who do reopen face higher insurance costs which ulimately mean they get passed along to the consumer. Another obstacle is lack of business which KMOX CBS in St. Louis reported on in October. Quoting one business owner stating his sales were down 40%. In the end, Ferguson will probably never get back to what it was before the riot. Next Post → How Much Money Goes Into March Madness Bracket Pools? Linda Sarsour is the Executive Director of the Arab American Association of New York, co-founder of Muslims for Ferguson, Methods used in Ferguson: vandalism, looting, rioting. The December 2016 Ferguson riots cost $20 Million according to Garry Earls, St. Louis CFO. In the end, Ferguson will probably never get back to what it was before the riot.She led the successful, progressive coalition to close New York public schools for the observance of two of Islam’s holy days. She was One of the organizers involved in the recent woman’s march in Washington. Sponsored & partially Funded by Planned Parenthood. Her agenda is to promote Sharia Law iwithin the United States.